Official PES Twitter has revealed KONAMI's most anticipated sport game this year, Pro Evolution Soccer 2018 for PC. As we expected before, Pro Evolution Soccer 2018 is as good as console version ( PS4 / XBOX One ). It's even better than two of them. 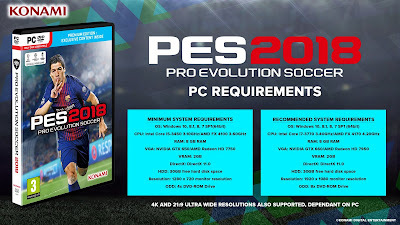 And PES 2018 also is the first PES version to support DirectX 11 & Windows 64-bit ! So, if you're running an old PC, time to upgrade your PC now ! Read more details of PES 2018 from official konami PES 2018 here. The PC version of Pro Evolution Soccer 2018 is already come to steam. It comes with two version release. Pro Evolution Soccer 2018 Standard Edition for US$59.99 and Pro Evolution Soccer 2018 - FC Barcelona Edition for US$69.99. 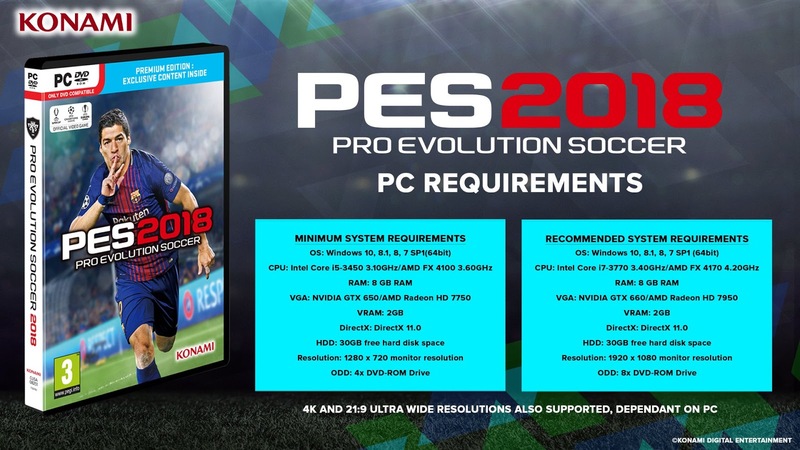 GAMEISOFT | Download Game And Software: PES 2018 PC System Requirements Revealed !